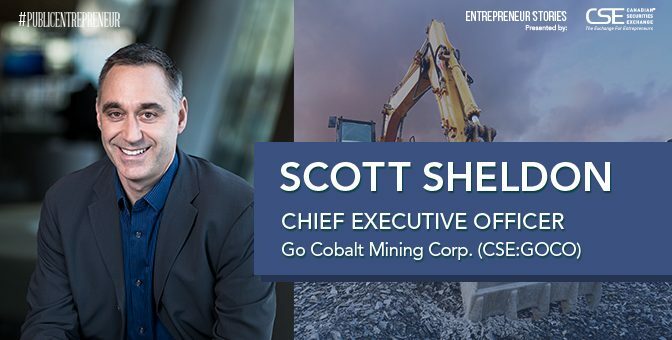 It was serendipity that led Go Cobalt Mining Corp CEO Scott Sheldon to the exploration company’s flagship Monster property in Yukon, Canada’s Wild West which is seeing a modern-day minerals-rush. The Monster property is located 80 km north of Dawson City, in Yukon. As the material needs of the world’s seven billion people continue to grow, there has been a rush to exploit the Yukon’s exceptionally rich resources — gold, zinc, cobalt, and more. As a junior mineral exploration company, Go Cobalt is focused on copper, gold and cobalt projects in Canada. Yukon’s industry-friendly regulations attracted the battery metals company which has been in the resource rich region since 2011. Go Cobalt is on the right track as the fundamentals supporting the cobalt sector such as the electric vehicle and energy storage booms continue to grow stronger. Sheldon has mining in his veins. His father Don Sheldon raised capital for junior resource companies for nearly three decades. “I started working in the industry when I was 16 years old up in the Golden Triangle of northern British Columbia,” said Sheldon. “I continued to do this every summer through university to help pay for my degree” added Sheldon, who graduated from Dalhousie University in Halifax. Interest in Yukon began in the 19th century when gold prospectors pushed northwards and plied creeks with picks, pans and shovels. Today, the Yukon in the northwestern wilderness of Canada is considered one of the best mining jurisdictions in the world. Co Cobalt’s Monster property in the Yukon is a copper, cobalt, gold prospect covering 63 square kilometers of the Ogilvie Mountains in the Dawson Mining District. The company believes its Monster project represents a large, prospective opportunity because it lies on the Wernecke Breccia, a region of the Yukon known to host iron oxide copper gold (IOCG) style minerology. The tremendous size, relatively simple metallurgy and relatively high grade of IOCG deposits can produce extremely profitable mines. The Monster has zones of elevated copper and cobalt concentrations across the entire 19 km length of the property. The Monster’s IOCG mineralization is hosted within and directly adjacent to the Wernecke Breccia. “Major iron ore copper gold deposit trends have recently been recognized for hosting cobalt and offer high-tonnage potential,” said Sheldon. Go Cobalt now covers 6,000 hectares of the Wernecke Breccia in the northern Wernecke Breccia belt and has high grade copper (over 3%) and cobalt (over 9%) on the property. “There is also anomalous gold and silver. Traditionally IOCG deposits will be polymetallic and offer a range of minerals,” explained Sheldon. Go Cobalt has started work on the Monster using satellite imagery and roped in geoscientist Rodrigo Diaz, an expert in IOCGs and remote spectral geology, for optimizing the mineral exploration process. Go Cobalt doesn’t require additional environment permits at this point in its exploration program. The company will use one of the two air strips within 10 km of the property to stage its 2019 program. Go Cobalt says it has adequate funds for the mining season. “We have about $1 million in the bank. Half of that is flow through funds to be spent this season. We also have about $1.8 million from outstanding warrants that are all ‘in the money’, said Sheldon. Some miners have really concentrated positions because they are focused on the short term. However, Go Cobalt is aware a complete absence of diversification can be painful for performance. Therefore, it also has a Barachois project, a sediment hosted vanadium-selenium-silver-lead-zinc prospect in the Gaspe area of Quebec. The project covers 1,801 hectares where carboniferous aged sediments have been shown to host sedimentary vanadium-zinc-lead mineralization. The latest, greatest utility-scale battery storage technology to emerge on the commercial market is the vanadium redox battery, also known as the vanadium flow battery. V-flow batteries are nonflammable, compact, reusable over semi-infinite cycles, discharge 100% of the stored energy and do not degrade for more than 20 years. These batteries use the multiple valence states of just vanadium to store and release charges. Go Cobalt is leveraging the global shift from fossil fuels to renewable energy by banking on a basket of battery metal projects. Global demand for cobalt, nickel and silvery-grey, malleable vanadium has skyrocketed in recent months with high demand from electric car and laptop makers. This story was originally published at www.proactiveinvestors.com on February 15, 2019 and featured in the Public Entrepreneur magazine. Learn more about Go Cobalt Mining Corp. at http://www.gocobalt.ca/. 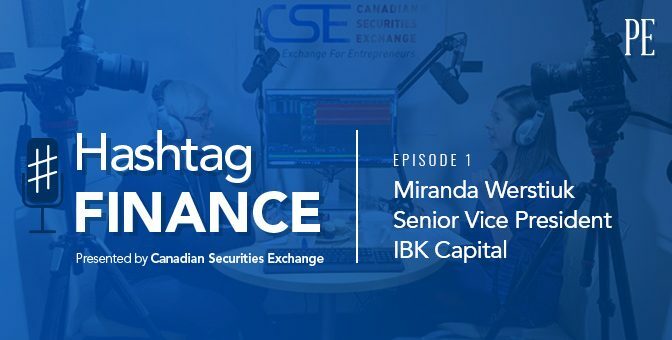 IBK Capital’s Miranda Werstiuk sits down with Grace Pedota to reflect on her career in capital markets, being a woman in mining finance (4:15), and to share her vision for sustainable mining practices utilizing blockchain (9:45) and more. In just a few days, the 2014 edition of the PDAC conference will take place. Hundreds of exhibitors and thousands of attendees from all over the world are expected to converge at the Toronto Convention Centre to learn about and discuss the latest trends, thoughts and technologies impacting the mining industry. Among the dozens of topics that will be discussed in various panels and workshops, one of the burning issues on the minds of many attendees will be the current capital raising climate. As many readers may already know, the CSE has been actively engaging in the conversation about finding ways to enable junior mining and exploration companies to successfully weather the current capital raising storm. From the exhibition floor to the podium, the CSE will continue in its efforts to promote innovative and pragmatic solutions for junior mining and exploration companies as well as for the industry as a whole. CSE CEO Richard Carleton will be a member of a panel of guests representing stock exchanges in Canada, Australia and Peru as part of the session entitled “An Exchange with the Exchanges: The Role of Stock Exchanges in Facilitating Capital-Raising.” This panel will discuss the state of the mineral exploration industry and the role that stock exchanges can play in helping companies navigate the current capital environment. For more information on this session at 10:30AM please click here. The CSE is co-sponsoring a lunch and networking event along with MNP LLP, and Chitiz Pathak LLP. This event will feature presentations from CSE-listed companies as well as opportunities for PDAC attendees to network with one another. Click the following link for more details on the PDAC Investor Lunch which is to be held on Tuesday March 4th from 11:30AM to 1PM. For those interested in learning more about how to make the transition to the CSE, be sure to register for and attend the Making the Switch session on Tuesday, March 4th from 1:15PM-2PM. In addition to events, the CSE will also be exhibiting at booths 2542 and 2544 where attendees can meet with members of our team as well as talk to representatives from several CSE listed companies. 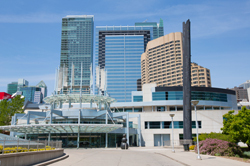 PDAC 2014 runs from March 2nd to March 5th in Toronto at the Metro Toronto Convention Centre. For more information, including registration information and schedules, you can visit their website at http://www.pdac.ca/convention. If you are attending, be sure to say hi to our team in person or via Twitter. We look forward to seeing you there! This is a video that Benjamin Cox, Managing Director of Oreninc, produced last September espousing the virtues of a then-CNSX listing for junior mining companies – everything still applies under the new name of CSE.